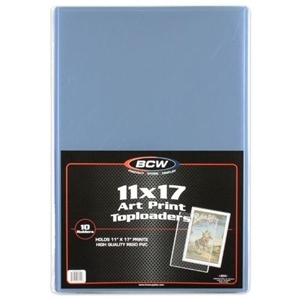 The PVC used in BCW Toploads contain no plasticizers or stearates. Our high impact grade PVC does not migrate and will not harm your cards, photos or prints, while offering maximum protection and visual appeal. Use this holder to protect, store and display your 11X17 photographs, prints and documents. Sold in packs of 10.